The character of Red Sonja appeared for first time in nº23 of Conan The Barbarian. Her scriptwriter was Roy Thomas and her drawer was Barry Windsor-Smith. The character of the warrioress of Marvel was based on one of the stories by Robert E. Howard (the creator of Conan. To know more about his read this article), to be more precise, in "The Shadow of the Vulture". 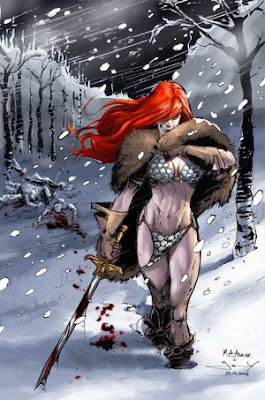 Although other similar female characters had appeared in the stories of Conan, like Jenna or the daughter of Zukala, Red Sonja had some elements that made her very appealing for the reader. Red Sonja was a brave warrior, very attractive, with a strong personality, independent, and somewhat arrogant. The story of Red Sonja is the following: she was 17 years old when some mercenaries killed all her family. They killed her people and set fire to everything. The chief of the band raped her. A cry of pain got out of her mouth and she claimed for vengeance so loud that Scathach, the Red Goddess, decided to help her and told her how to handle weapons and fight. In exchange for that, she will never make love with any man in her life unless he beats her in combat. Sonja lived alone, and grew without protection, and learn to hate and how hard life can be. When she was eighteen, she became a famous warrior and thieve. Her fame of wild woman was very widespread. When Red Sonja joins to the soldiers that fight against the Turianians, she mets Conan. Conan feels a big attraction for Red Sonja, not only for her physique but also for her personality and her way of fighting. In all their adventures, Red Sonja always abandons Conan, she seduces him and abandons him. The first clothes of Red Sonja where some trousers, and a chain mail. Later, these where replaced by something similar to a metal bikini. In one of her adventures, Red Sonja finds the man that raped her. But he is half dead and she cannot take revenge on him, and invokes the demons that torture her. Since that day, Red Sonja fights against sorcery, in addition to working as a brilliant mercenary for kingdoms and kings. When Red Sonja meets Conan paired up with Belit the pirate, Belit feels terribly jealous. When Belit died, there continued to be a powerful attraction between Sonja and Conan, but because of her promise to the goddess, this relationship was never possible. 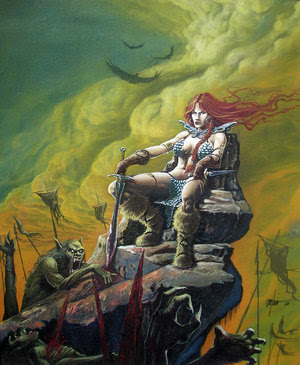 Red Sonja has her own comics where she is the main protagonist, and not only one more of the characters that appear in Conan. Maybe there were too few numbers. But her tenacity, her bravery, and her long red hair turned her into an unforgettable warrioress of Marvel. Images (in order): Red Sonja I, by Valzonline; Red Sonja, by Anjum; Red Sonja Cover Sample, by RodGallery; Red sonja OIL, by imaginante. Great post, Emma. I have hear of Red Sonja, but knew nothing about her background. Her character reminds me of a the main character in Sigrid Undset's novel Gunnar's Daughter. The novel is set in pre-Christian Norway.